Traveling can be both fun and stressful! 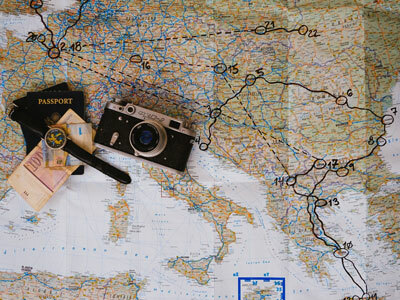 There’s so much new territory to explore, languages to learn, and places to see. Ellie Kemper, star of Unbreakable Kimmy Schmidt and author of MY SQUIRREL DAYS, shares her rules of travel from her own personal experience being abraod. I’m not sure if it was the glimmer of the big-city lights or just the freshness of a new land, but I knew from the moment I stepped off the bus in Hannibal, MO, that I was meant to roam. Look at the post office, I thought to myself, my fellow sixth graders clambering and yelling all around me. And there’s the highway, too. There was a post office and a highway just like in my own hometown of St. Louis, MO, but I may as well have been in a different universe. Everything felt new again in this exotic place, and I was invigorated. “When do we go to the caves?” some adolescent klutz shouted next to me. “Yeah, we wanna see the caves!” echoed his idiot sidekick. I rolled my eyes and smiled at the teachers. Let’s skip the caves and go straight to the Mark Twain Boyhood Home and Museum, I mouthed to Mrs. Hoffman. After that, I would really enjoy an opportunity to check out the Mark Twain Memorial Lighthouse and old Nipper Park, I kept mouthing. “What?” Mrs. Hoffman shouted. “Ellie, are you going to throw up?” A couple of my carsick traveling companions were currently puking at a nearby McDonald’s. “No, I just—I’m fine,” I replied. “I’m fine, Mrs. Hoffman.” I shook my head and chuckled to myself. It’s not that I was ashamed of the people I was with; it just felt funny to be the most sophisticated person there. Learn the language of the new land. Adopt the customs and dress of the new land. Do not sit still. Get out there! The new land is yours for the taking, and you can’t take the new land if you are not walking everywhere and in constant pain. Blisters and blood prove that you actually did something. Always take the free breakfast. To learn more about Ellie Kemper’s life behind the scenes pick up a copy of MY SQUIRREL DAYS! Excerpted from My Squirrel Days by Ellie Kemper. Copyright © 2018 by author. Used by permission of the publisher. All rights reserved. Comedian and star of The Office and Unbreakable Kimmy Schmidt Ellie Kemper delivers a hilarious and uplifting collection of essays about one pale woman’s journey from Midwestern naïf to Hollywood semi-celebrity to outrageously reasonable New Yorker. There comes a time in every sitcom actress’s life when she is faced with the prospect of writing a book. When Ellie Kemper’s number was up, she was ready. Contagiously cheerful, predictably wholesome, and mostly inspiring except for one essay about her husband’s feet, My Squirrel Days is a funny, free-wheeling tour of Ellie’s life—from growing up in suburban St. Louis with a vivid imagination and a crush on David Letterman to moving to Los Angeles and accidentally falling on Doris Kearns Goodwin. Ellie has written for GQ, Esquire, The New York Times, McSweeney’s, and The Onion. Her voice is the perfect antidote to the chaos of modern life. In short, she will tell you nothing you need to know about making it in show business, and everything you need to know about discreetly changing a diaper at a Cibo Express.